My son has just been diagnosed with Epilepsy and suffering from temporal lobe seizures, which are about the strangest things I've ever seen. 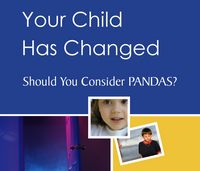 (coming from a PANDAS parent, that is saying a lot!) Anyway, my question is this...are there any other kids out there with PANDAS that also have been having seizures? My son doesn't have any known risk factors for epilepsy and we haven't had our brain imaging or EEGs yet, but one cause for these seizures is encephalitis. This makes me wonder if my son suffered from encephalitis as he was having his first onset of PANDAS 3 years ago. Would love to connect with any PANS or PANDAS parents that also have been dealing with epilepsy. my ds11 has episodes that I have described as seizures but I'm not sure if that is what they are. Sometimes they are very silly with bad language no body control and eyes rolling back. Almost like drunken behavior. Is this anything like the strange you are experiencing? I would never have thought to even google the symptoms, they are so strange. But fortunately for me a doctor saw him have one on Sunday and explained what was going on. You might try connecting with RNMom here; I haven't seen her on the forum for quite some time, but if I recall correctly, her son had been diagnosed with some type of seizure, and he was prescribed some medication for it, in addition to PANDAS/PANs treatment. Thank you! RNmom if you're out there, let me know! Well most likely be starting anti-seizure meds as soon as we get the imaging and testing done. I don't know Pandas kids with epilepsy, but I do know several Lyme kids with it. Have you had your son tested for Lyme? We went down the Pandas road ourselves for 5 years before discovering that my DD really has Lyme/Bart. She is on the road to recovery thankfully. One child I know, was suffering from Absence Seizures, treated for Lyme and now fully recovered. We have tested for Lymes but not recently. I suppose I will ask the Epileptologist on Friday when we go to our appointment.